At 33, Ajay Gupta has come a full circle. After starting out as a Sadbhabana activist, quitting the party when Badri Mandal and Anandi Debi split, winning the royal municipal elections to become Gaur mayor as an independent, allegedly encouraging the massacre of Maoists last year, and joining the TMLP for two months, Gupta has returned to Sadbhabana as their candidate for Rautahat 1. Still, Gupta says: "I have been consistent and never joined any big party." On campaign trail at the Barharva village he speaks to a group of men playing cards and smoking bidis. "There are two parties in the country, Pahadis and Madhesis. Vote for me, otherwise we will have to live as slaves for another 100 years." Gupta visits women at home, asking them to pat him on his back. He tells the young that only a Madhes sarkar can create jobs so that they do not need to go to Punjab, and among his accomplishments cites an "international" cricket tournament he organised as mayor. Gupta is banking on votes from the municipality and support of the young across castes. "I will get 8,000 votes from Gaur, five or six thousand from nearby villages," he predicts. But he faces competition from NC's Braj Kishore Singh, UML's Rewant Jha, formerly a secretary to Madhab Nepal, and the MJF's Amar Yadav. Gupta's bright prospects represent a change in electoral dynamics from Rautahat to Sunsari over the past two weeks. 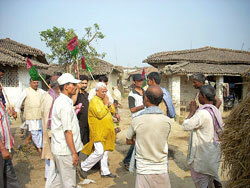 Madhesi parties are finally picking up steam, with more active campaigning. They are making inroads in most seats in the eastern Tarai. The question is, can they capitalise on it in the last three days? The MJF was relatively strong, but the TMLP and SP are also picking up. For its part, NC is facing an uphill battle in most areas of its traditional vote banks in the eastern Tarai, especially in Dhanusha, Siraha, Saptari and Sunsari. Across the region, however, there is also fear and apprehension. The failure of talks with the four minor militant groups, Biratnagar mosque attack, blasts in Rajbiraj, Janakpur and Birganj, and Jwala Singh's threatened disruptions have caused worry. "You really think polls will happen? Won't people be scared to vote once the banda begins?" asks Indresh Jha, a Janakpur hotel manager. Journalist Alok Thakur says, "Most people either say elections will not happen or that they will not vote." A low turnout will help those who want to question the legitimacy of the process later, and this seems to be what the armed groups want. Jwala sources told Nepali Times they will kill and kidnap a few candidates next week. "We do not have the capacity to stop polls but want to create fear," he said bluntly. Jwala is trying to patch up with Goit's group. And royalists are threatening more blasts to provoke communal violence. SARLAHI-The face of the Madhesi movement is running a neck-to-neck race against a man instrumental in the peace process here in Constituency 6 of Sarlahi. The NC's Amresh Singh may not be very well known, but he is powerful. A favourite of Indian ambassadors Shyam Saran and Shiv Shankar Mukherjee, he has been an intermediary in the peace process from November 2005 onwards. Trouble is, Mahanta Thakur is also Delhi's man in Madhesi politics. The even greater irony is that Thakur had a lot to do with Singh's success story. "Amresh was Thakur's sycophant," quips Deepak Mishra in Thakur's Brahmin stronghold of Laxmanpur in this eastern Tarai district. When asked to comment Singh told Nepali Times: "I also helped him, and he had independent access to Girijababu." Singh was a student at Delhi's JNU, and after the king's coup of 1 February 2005 introduced Nepali political exiles to the Indian bureacuracy. From messenger, Singh soon became a player in talks between Koirala, Prachanda and India. A confidante of Home Minister Krishna Sitaula, he was nominated into the interim legislature. Singh is rumoured to have encouraged Thakur to quit the NC, but he himself stuck it out in the party. Thakur loyalists see this as a "betrayal and anti-Madhesi act". Singh counters it was Thakur who betrayed him, by promising he would stand in PR but filing his nomination. At Balra village, telephone booth owner Raja Ram has got the caste politics all figured out. "Brahmins will vote for Thakur, Bhumihars for Singh. Rajputs will split.The Mahato, Sahani and Dalit vote is going for Singh. Yadavs will go to MJF's Shiv Pujan Yadav," he says. Others however believe Thakur will win easily. Malangwa journalist Rajesh Mishra says, "Thakurji will sail through because of his image, work and credentials." Even a local sitting at the Balra tea-shop, Ali, knows who is who. He tells us: "Amresh has the blessings of the ambassador." As elections draw closer, the rhetoric is getting sharper. Thakur camp accuses Singh of spending money to buy voters, and planning to capture booths with the complicity of "his friend Situala". Singh retorts: "Mahantaji has ten cars and is using armed groups to threaten me." prime minister's quota of 26 members.